I should say that in watching this film, I was a bit out of my element. I think that for me, the best way to understand this film is that it’s a metaphysical, stream-of-consciousness picture, a Coen Brothers surreal comedy rather than a Coen Brothers detailed drama. So as I’m watching the film, I’m trying to figure out whether it’s a comedy that uses bowling as a metaphor for life, or whether it’s a comedy that uses life as a metaphor for bowling. And if we add in a replacement rug (that apparently compensates for a rug that really tied the room together), a kidnapping of a woman named Bunny Lebowski, who I understand is married to another Lebowski – meanwhile there’s a guy called Jeffrey Lebowski, who is the titular character called the Dude, a free spirit who lives on a diet of weed, White Russians – er, Caucasians – and bowling, while avoiding bathtub-swimming marmots. Yeah, I’ll figure this film out. Halfway through the film, I’m trying to figure out which MacGuffin I’m not supposed to follow. Believe me, I’ve read Dashiell Hammett novels that aren’t as complex as this. And all these characters intersect and travel through this plotline – er, plotlines – with a plethora of catchphrases and punchlines, many of which I can’t reprint in this blog without my TU blog cursing filter melting down. 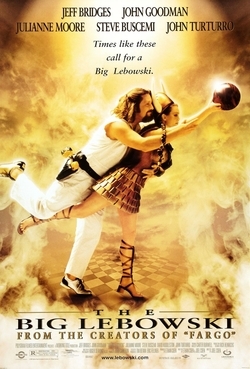 I may not have understood The Big Lebowski on its first viewing, but I think there’s enough of it for me to watch it again some time. Maybe that’s its appeal. To be able to laugh and quote the lines from the film, and to appreciate the characters of the Dude and Walter and Donny and all the rest. Heck, it might even convince me to step back in a bowling alley and once again bowl. Even if it’s on shabbos. It sounds like your first viewing was just like mine. I saw it on IFC about a year after it came out in the theater, and my reaction after first watching it was “what the hell did I just watch?” I had to watch it again, and again, and again, and it’s one of my favorite films. When it plays at Proctors later this year, you should definitely come. They put on a fun production and event, and it’s cool to see the culture that has spun out of the film (luckily it’s not as intense in this area as it is elsewhere). Eh… should have gone with Goonies. Lillywhite – that’s on the club list and will be watched soon, maybe in the next week or so. You should have watched Ferris Bueller’s Day Off. I like the Big Lebowski, but think it falls apart in the last act. Jango – don’t worry, Ferris Bueller’s Day Off is also on the club list, it’ll probably be the next film I watch. This film should actually be watched more than once. And the Dude refers to the OTHER Lebowski as the Big Lebowski. One of my all time favorite movies. This was my #1 movie of 1997 (or whatever year it came out) when I was a film critic. Yeah the plot is a little confusing initially but you’ll be able to follow it easily the next time around. Though the plot is a bit irrelevant, it’s more about all the wacky shenanigans the Dude gets into. In the Coen Brothers universe the villain ALWAYS sits behind a desk. Always. Check out their “Intolerable Cruelty” for an even sleepier sleeper. This –> “This is by far one of my favorite movies. It’s about a rug that really pulled the room together” YES! I watch it for it’s sheer rediculousness. The Big Lebowski is all about the brilliance of the dialogue. The material is amazing. Its awesome. I went to Lebowskifest in Louisville a few years ago. We met the actual Dude and drank a ludicrous amount of White Russians. Good times were had by all. Also, poor Steve Buscemi does not fare well in Coen brothers movies.